In the 995th year of the 2nd millennium in the land of the Cimmerians, Scythians, and Sarmatians, an extraordinary girl will be born. This supreme Mai, rumored to be part God and part Human, is the one the Mai have been awaiting for many, many years. She’ll be called The Uniter. For her first 16 years, The Uniter will be protected and cared for by a human parent. During this time, she will not know about her great powers or unique position. 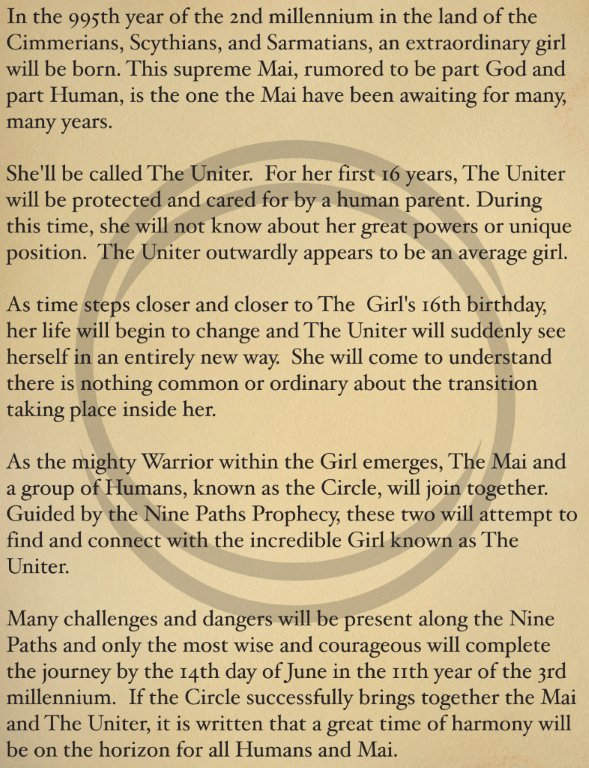 The Uniter outwardly appears to be an average girl…As the might Warrior within the Girl emerges, The Mai and a group of Humans, known as the Circle, will join together. Guided by the Nine Paths Prophecy, these two will attempt to find and connect with the incredible Girl known as The Uniter. 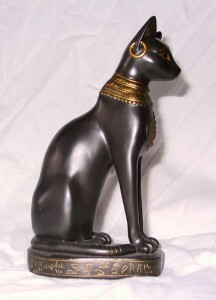 What city in Egypt contained a “cult” that was dedicated to the Goddess connected to this statue? Feel free to share your commitment to finding The Uniterin the video’s comments. The clue for the Third Path arrived a few days later with a message to decode using the Book of Mai (left), a document given to every member of the Circle of Strangers. The decoded message read: Chloe King is The Uniter. The clue for the Fourth Path arrived today — a message regarding the baby bib that arrived as part of the initial package. The bib’s tag displayed the Mai symbol for “trust” with a web address. Tomorrow, June 3, I will tweet the code word that you can use to uncover a new video clue about Chloe King. There is still time to join this quest and enter to win your circle charm. I will tweet the code once on Friday, June 3. Two new code words will be revealed around June 6 and June 13. The Nine Paths to Chloe King Free Gift offer (â€œOfferâ€) is valid from 5/24/11 at 8:00 AM Pacific Daylight Time (â€œPDTâ€) to 6/14/11 at 11:59:59 PM PDT or until supplies last, whichever is sooner. Offer open to residents of 50 US & DC, 13 & older who follow a participating blogger in The Nine Paths to Chloe King Blogger/Journalist Program (â€œBloggerâ€) at time of redeeming free gift (â€œFree Giftâ€). Each 1 of 3 Free Gifts available is tied to a different code word which will be revealed by Blogger at 3 separate times (estimated to be 5/24/11, 6/6/11, and 6/13/11). To redeem a Free Gift (while supplies last), go to a http://abcfamily.go.com/shows/nine-lives-chloe-king/nine-paths & enter code. Expect Free Gift within 8â€“10 weeks from 6/14/11. Limit: 1 Free Gift/person. Void where prohibited.